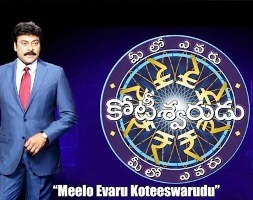 Meelo Evaru Koteeswarudu Audition Dates (MEK Audition Timings) and How to Register in Maatv Online Mek Registration in mek.maatv.com …. In our India one of the Popular TV quiz show is KBC i.e known as Kaun Banega Crorepati. Meelo Evaru Koteeswarudu (MEK) has also same procedure to ask questions to people and giving the money to the winners. After a long gap again MEK is back and it can begins as soon. MEK will be aired on Maa TV from Monday to Thursday at 8.30-9.30 PM.In the MEK Season 4 Megastar Chiranjeevi will be the host. Last 3 seasons of Meelo Evaru Koteeswarudu was hosted by Akkineni Nagarjuna. Actually the promo videos of Meelo Evaru Koteeswarudu Season 4 already running in Televisions. From 11th October 2016 onwards questions will be asked by Megastar Chiranjeevi. There are total 15 questions asking in the show and the 15th question is worth 1 Crore rupees. After the completion of asking questions the call for entry questions of MEK season 4 will be begin as shortly. The MEK registration of season 4 will be send via SMS and IVRS. Do we need to answer all the 3 questions asked over phone to select for audition?